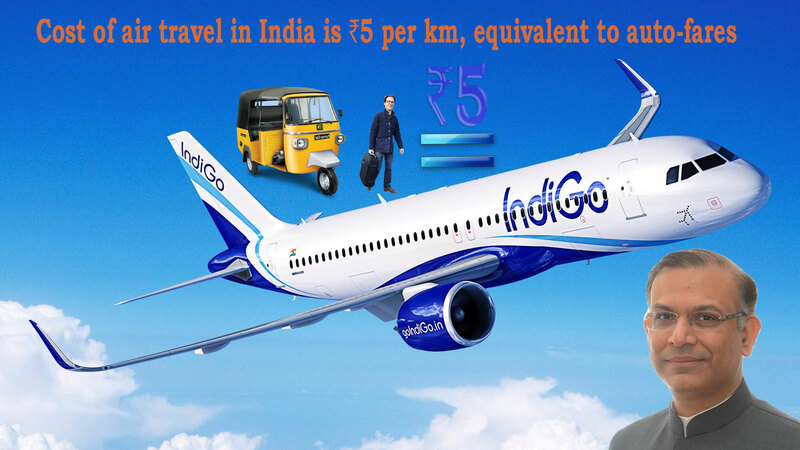 Stating that “affordability” is driving the demand in India’s aviation sector, Union Minister of State for Civil Aviation Jayant Sinha said on Friday the cost of long-distance air travel in the country is ₹5 per kilometre which is equivalent to auto-rickshaw fares. “Affordability is driving the demand. Because of the continued stability in the Aviation Turbine Fuel (ATF) prices, which constitute 30-40 percent of the flying cost and because the aviation technology is moving quickly, flying continues to be very affordable and therefore you will continue to see strong demand for aviation going forward,” said Sinha at the inaugural session of the Gujarat Aviation Conclave 2017 organised by Confederation of Indian Industry (CII). “The demand for aviation in India is literally, going through the roof. The reason is aviation in India has hit rail parity… The price of flying now is equal to price of travelling in air-conditioned coaches of Indian Railways,” he said explaining that 16 crore people in India either travelled on a domestic or international flight last fiscal, compared to 13 crore people who travelled in air-conditioned rail coaches. The minister also said that airline operators in India currently operate about 500 aircrafts. “Orders for another 850 planes have already been placed, of which 400 will come in the next five years,” Sinha said. He, however, said that India with 160 million passenger trips a year had a long way to go before catching up with China which has 500 million passenger trips and United States which has 900 passenger trips. Apart from this, the minister said that India will also be buying about “600 warplanes” in the next 10 years. Meanwhile, in a separate development, a senior official of Airbus Group said that it will deliver one aircraft per week to airline operators in India for the next 10 years. “With over 260 flying aircraft with carriers and an order backlog of over 550 aircraft, we will deliver an average of one aircraft per week to the Indian air carriers for the next 10 years,” said Ashish Saraf, vice-president, industry development, strategic partnerships and offsets, Airbus Group India Pvt Ltd.
GK Ahukiyal, executive director-RCS, Airport Authority of India (AAI) pointed out domestic airline operators like Indigo has ordered 50 ATRs, while others like Spice Jet has also ordered new aircraft. Amitabh Khosla, country director (India), International Air Transport Association (IATA) said that India was poised to emerge as the third largest air passenger market by 2023.